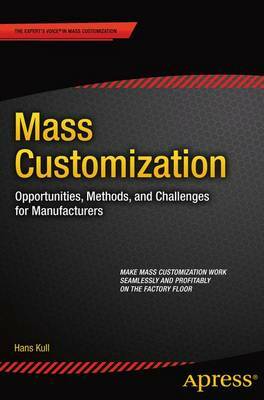 Mass Customization examines the business opportunities, considerations, and challenges manufacturers in various industries must weigh before committing to the significant investment in machinery and software needed to go to mass customization. For manufacturers who decide that it's time to take the plunge, the author describes the proven methods and latest technologies for making mass customization work seamlessly and profitably on the factory floor. Mass customization-the automated manufacturing bespoke products, profitably combining the low unit costs of mass production with the flexibility of building custom products to order-has been touted as the next big thing for more than a quarter of a century. Until recently, however, mass customization made only modest inroads in a few industries. Now, the convergence of new ICT and manufacturing technologies with traditional CNC technologies means that mass customization's moment has arrived for breaking out into a wide range of industries. Hans Kull is an engineer and mathematician who applies his expertise in combinatorial optimization, programming, and engineering to devising end-to-end automated solutions for mass customization, automating and optimizing all processes-from bespoke parts supply, order processing, production, and waste minimization to packing and delivery. He shares with his readers practical lessons for making mass customization succeed, case studies from various industries, and an insider's vision of the business implications of mass customization's coming of age.